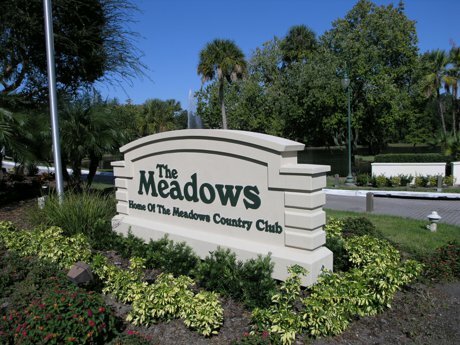 The Meadows Country Club is a private member owned community. Owning a home in The Meadows affords homeowners pristine manicured streets to drive without the requirement of a membership. You drive into the Meadows and enjoy tree lined streets. Water fountains are throughout the communities many lakes. Home styles range from entry level condominiums to maintenance villas all the way to commanding and wonderful sing family dwellings. Community pools can be found throughout the community and many have private pools. You can choose to back to one of the many fairways or if you prefer, a lake of preserve view are available for many of the homes. A social membership gives you access to tennis, fitness, and dining. For more information vist the Meadows Country Club website. A great place to be! Check out our Latest Sales in The Meadows! One of the nice things about living in The Meadows is that you have the serenity and classy backdrop of living in a golf course community without a mandatory obligation to join the club. So even if you aren't an avid golfer, living here gives you the benefit of living in a golf community without any of the costs. Benderson Park has been recently complete and is drawing interest into the area for it's internationally renowned rowing facility. It also offer a fantastic setting for a relaxing bike ride or walk at the end of the day. The Mall at University Town Center (UTC) is the latest addition and offer major upscale shopping.